Each year Pantone selects one color to represent the year and this trend-setting forecast influences design at a global level. To understand this reach, you need to know that Pantone is a company which utilizes a proprietary color matching system to help designers, manufacturers, vendors, regular people, and basically, everyone, match colors. For 2019, the Pantone Color Insitute has selected Living Coral (16-1546). Find out more about Living Coral and how this vibrant color can breathe life into your custom reusable bags and other marketing efforts. Living Coral is an energizing color that inspires, motivates and brings joy. Found in nature, Living Coral represents the vibrancy and mesmerizing activity of the coral reefs. “Coral is an equalizing lens through which we experience our natural and digital realities and this is particularly true for Living Coral. 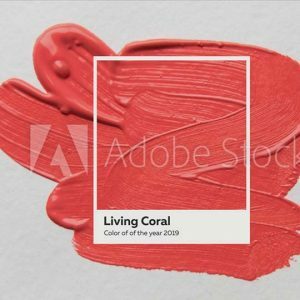 With consumers craving human interaction and social connection, the humanizing qualities displayed by the convivial Pantone Living Coral hit a responsive chord,” explains Leatrice Eiseman, Executive Director of the Pantone Insititute. From runways to home decor and more, Living Coral will be a constant throughout 2019. Capture this trend by including Living Coral in your marketing, specifically in the design of your custom reusable bags. We offer full-color printing on custom reusable bags and we can match to Pantone colors, meaning you can include this stunning and beautiful color is all of its envigorating vibrancy on your custom bags. Full-color printing enables you to transform your custom reusable bags in show-stopping pieces of art that capture people’s attention and help raise awareness of your brand. Consumers are naturally drawn to custom reusable bags due to the convenience provided. Reusable bags also make amazing promotional products that deliver tons of impressions while making the most of your marketing budget. Increase the appeal of your custom reusable bag design by creating bags that are visually appealing and on-trend by including the color Living Coral into your design. Get creative and use Living Coral as an accent color, or go bold and make it the primary color. However, you use Living Coral in your custom reusable bag design it is sure to be stunning and help capture the energy and connection this color evokes. We’ve been in the business of creating custom reusable bags for almost 30 years. We are passionate about helping our clients create eco-friendly and functional promotional products that reach their clients and grow their brands. During this time we have earned a variety of distinctions, including GOTS, Fairtrade, ISO 9001-2015, and FEDEX. We have also learned how to streamline the bag design process to make the entire experience quick and easy. Start to design your bag and we will get in touch with you ASAP to help you finish creating a special, one-of-a-kind promotional marketing piece that will help build your business. With an ad impression spend of 1/10th of a penny, you cannot go wrong!